3,000 pensioners protest 56 months unpaid arrears in Oyo state – Royal Times of Nigeria. Retired primary school teachers in Oyo state numbering about 3,000 yesterday staged a protest over their unpaid pension arrears running to 56 months. The former teachers, under the aegis of the National Union of Pensioners in Oyo state, said they could not bear the pangs of hunger again after several months of unfulfilled promises by the state government. The protest started from the secretariat of the Nigeria Labour Congress, NLC, and proceeded to the Nigerian Television Authority (NTA), Agodi Ibadan and later to the government secretariat. The Deputy Governor, Chief Moses Alake Adeyemo and the Secretary to the state Government, Alhaji Olalekan Alli appealed to the aggrieved retirees saying the governor was out of the country. He said, ‘’We feel for your plight. However, the Governor has travelled out of the country at the moment, and I cannot do anything about your plight until the governor comes back. Speaking with Vanguard in a telephone interview, the state NLC chairman, Mr Waheed Olojede said the leadership of the labour union could not stop the aggrieved retired teachers from protesting because they have been suffering in silence for long. 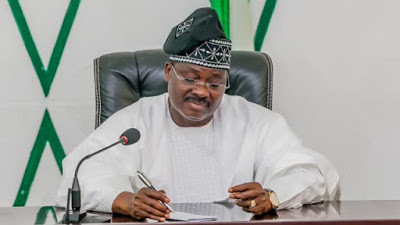 According to him, several pleas made to the Oyo state government to settle the arrears of pensions, which run from 17 to 56 months, have not yielded any results. The government paid them last in 2008. Olojede said, “We have made several efforts from the union to make the government settle the arrears but all meetings we have had so far have not yielded any results. “So, when they gathered at the NLC secretariat this morning (yesterday), I could not stop them. They are being owed between 17 and 56 months.